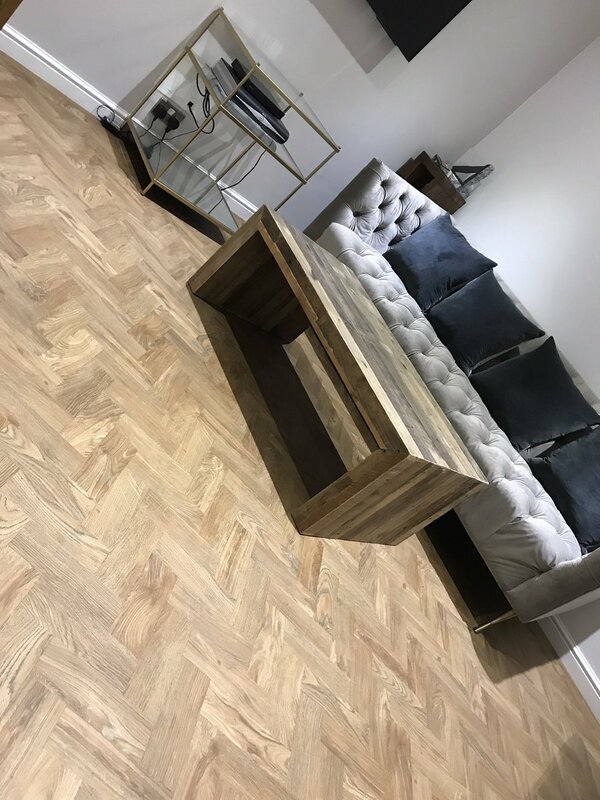 We have made several changes to our Knutsford flooring showroom, our haven of high quality, luxury flooring nestled in the heart of Knutsford. And this year, we have added several new LVT flooring brands to the showroom with extra space to spend time designing your next flooring project. Do come and visit! But before you do, read more about the practical, hardwearing and warm underfoot LVT flooring we have available. 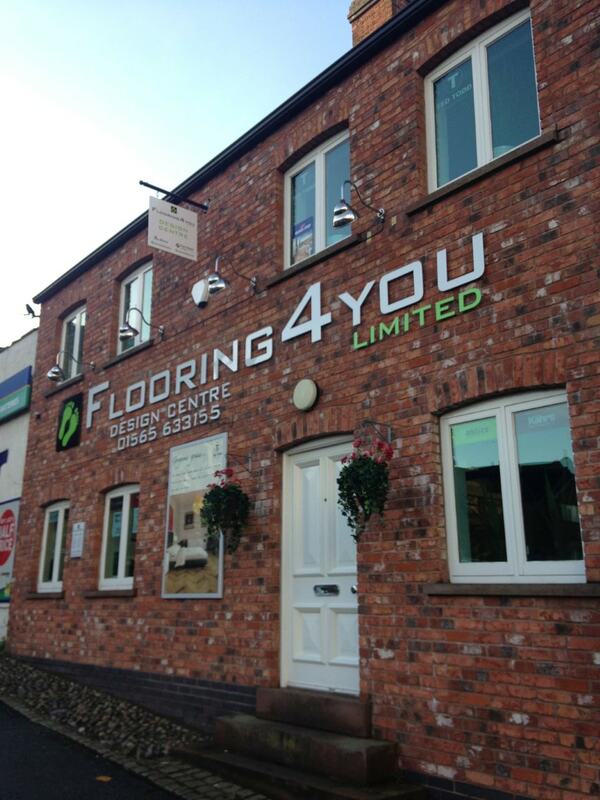 You can find Flooring 4 You on Malt Street in Knutsford, next to Knutsford Gym. Head down to the car park next to the river. No sooner do you walk through the door and you will find the exciting new patterned, hard-wearing flooring from Harvey Maria. This colourful LVT flooring brings inspiration from some of Britain’s leading names in contemporary design, including Cath Kidston, Dee Hardwicke and Neisha Crosland. The modern designs are available in a choice of stunning signature collections and look fabulous both on their own, or laid together with complementary patterns, block colour tiles or wood effect planks. Perfect for tough living environments, Harvey Maria flooring has a waterproof surface and easy to clean properties, making it ideal for kitchens, bathrooms, hallways, dining rooms and more. We blogged about it earlier in the year – take a look to find out more. Harvey Maria designer luxury vinyl flooring is bright, colourful and extremely practical. Better still you can mix and match tiles and planks to create your very own flooring creation. Alongside the Harvey Maria is an extension to the Distinctive Flooring range of luxury design flooring with a choice of timeless wood classics and stones in elegant styles. 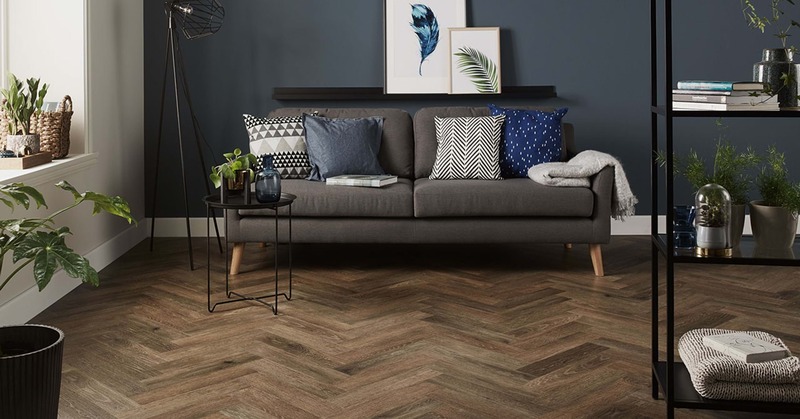 The vintage parquet LVT flooring collection from Distinctive gives you the flexibility of creativity with the choice of herringbone, zig-zag, brick or box laying patterns to suit your individual style and of course, being an LVT, it’s as practical as it is beautiful. One touch and you’ll fall in love – what sets Distinctive luxury vinyl apart from other LVT flooring brands is the aesthetic detail. Where there are replica grooves and knots for example, texture has been applied, making the planks very much like real wood. Distinctive parquet LVT flooring we recently installed to a home in Stockport – yes, it is a luxury vinyl and not real wood! 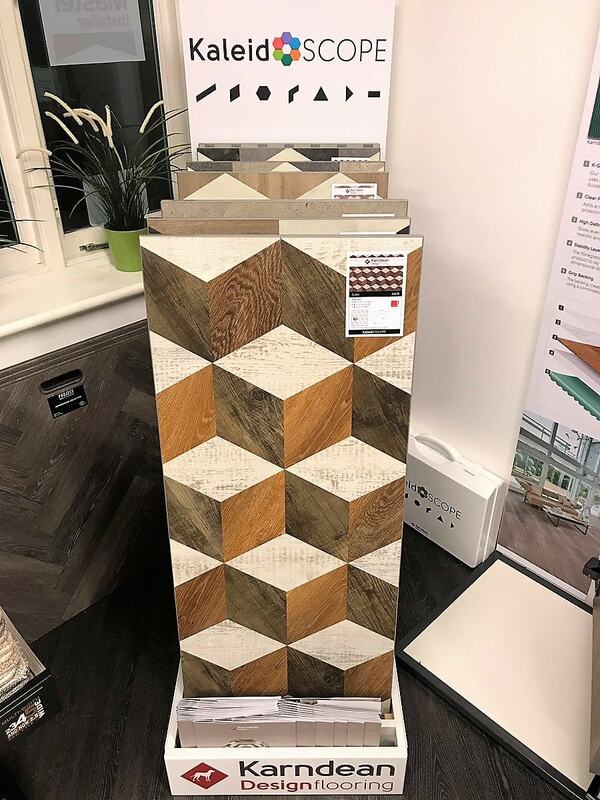 Downstairs in the Knutsford showroom, you will find our designated Karndean LVT flooring area with samples from all Karndean’s wood and tile collections, including Looselay Longboard and the new Kaleidoscope collection. Kaleidoscope is a unique selection of wood, stone and block colours available in six geometric designs, all cut from original Karndean products. So, not only can you be guaranteed the excellent technical specification come to be expected of Karndean flooring, including slip resistance and a high performing wear layer, but you can experiment with the patterns and shapes to bring your floor to life. Why not experiment with Karndean Kaleidoscope by visiting the Kaleidoscope Floorstyle online tool where you can choose your space, laying pattern design, colours and angle of the floor. Then come and see us for samples or a free quotation, including fitting. We recently welcomed the arrival of the new woods, stones and abstracts in Amtico’s Spacia collection. There are twelve new Spacia woods in a range of tones from sun-kissed greys to softened browns and deep cocoa black. A couple are available as parquet designs in 3” x 9” and 4” x 18” sizes with two different texture finishes to choose from. For the first time, Amtico also brings on-trend, concrete-style flooring to the Spacia collection with four new stones inspired by urban architecture. And not forgetting the abstracts where thirteen new styles bring more natural-looking flooring design choice, including Ridge from the Craft palette with its intricate, bark-inspired pattern, available in four different colours. All the new Amtico Spacia products have been designed and manufactured in-house at the Amtico site in Coventry, England, guaranteeing the quality associated with Amtico flooring products. Showing Amtico Spacia parquet in one of the new wood tones. Noble Oak is warm and classic in appearance, with golden tones and ripped dark grain for a timeless finish. If you have a large open space and are looking for a larger LVT flooring plank or tile for extra coverage, the new mFlor Grand range of planks and tiles are designed with size in mind. With planks measuring 200cm in length by 20cm in width, and tiles 910mm x 910mm – a lot more floor can be covered with fewer flooring pieces. Whether it’s LVT flooring, engineered hardwood or luxury carpets and rugs, there really is no other place in Knutsford where you can find so much luxury flooring under one roof. 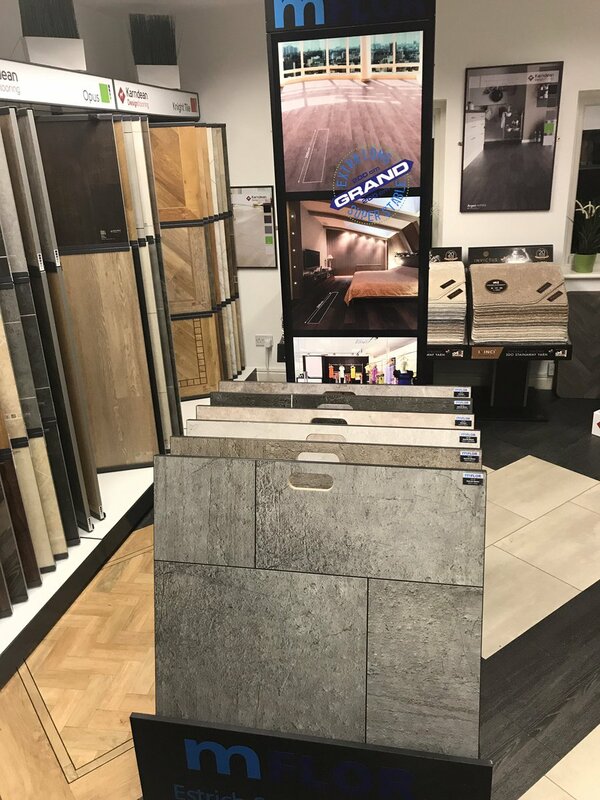 Open six days a week, come and visit our Knutsford flooring Design Centre to browse colours, tones and styles of LVT flooring, and design your very own unique floor. We also offer a high-quality, LVT flooring installation service with our team of professional LVT floor fitters, so you can be assured of the very best floor for years to come. Contact us for your free survey or call in to see us in Knutsford!